For millennia money has been a constant in human society. It is a persistent thread that entwines with politics, faith and warfare to allow us a window into past societies. For good or ill we all have a relationship with money. The emotions that it instills in contemporary society, from happiness to fear and everything in between, are not dissimilar from those felt by someone thousands of years ago. In 2013 the British government added elements of financial education into the national curriculum. This decision was compelled in part by a realization that whilst people may have a grasp of what money is, there are many facets to the monetary system that remain uncertain and even a mystery. ‘Money Matters’ is a new display, supported by Citi, in gallery 69a at the British Museum that explores some of the most important aspects of the monetary world. 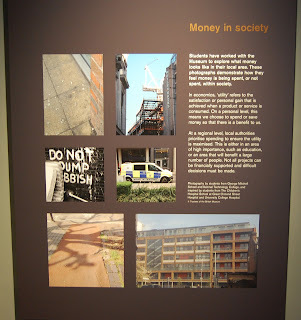 Objects from the British Museum collection are used to illustrate important concepts such as money creation and economic cycles as well as looking at the sociological aspects of money through the millennia. The display acts as a complement to the themes addressed in the permanent exhibition in Room 68, the Citi Money Gallery. The display is a collaborative project between the Department of Coins and Medals and Learning and National Partnerships. The co-curation has enabled work from a variety of audiences to be embedded in the display. School groups were invited to the museum to explore the concept of money and how it is used in society. They then translated what they felt money looks like in their local communities by taking photographs, which include a new housing development and litter on the street. A project was also undertaken with New Horizon Youth Centre where young people provided everyday words that are used interchangeably with 'money', such as 'racks' and 'wonga'. From working with community groups to provide a contemporary take on the modern financial world, to commissioning an original artwork to act as a focus for the exhibition, Money Matters acts as a companion piece to the established Citi Money Gallery education programme. 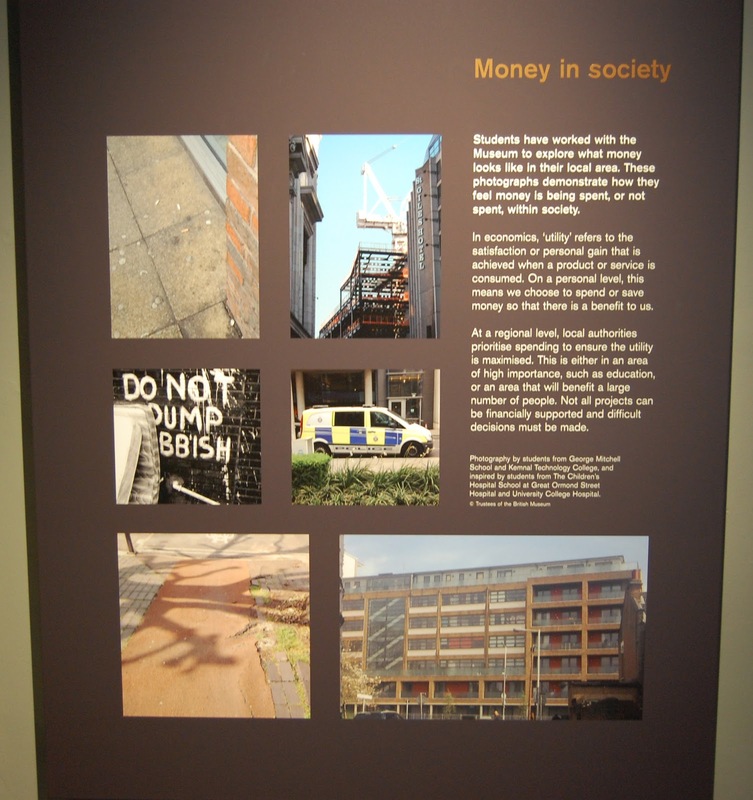 These visual elements included in the display are deliberately designed to be conversation starters; encouraging visitors to challenge their views and perceptions of money by considering those portrayed by various school and community groups. ‘Money Matters’ looks firstly at the material culture of money – the stuff that we hold in our hands and pass from one to another. Monetary supply has always been a concern for those in power. One of the earliest quantitative theories relating to money comes from Qi state in China over two thousand years ago. The concept recorded in the Guanzi extolls the virtue of the manipulation of monetary supply and defines money as having heavy and light properties, heavy when stored and light when in circulation. The provision of money is still a concern for governments, how much to pump into circulation and the attendant risks of under and over supply. However money is not, nor has it ever been, solely the preserve of a central issuing authority. 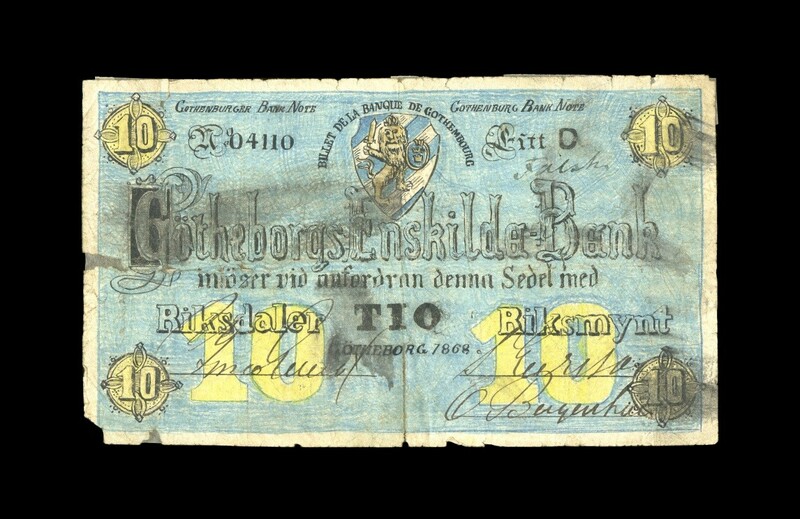 There have been numerous attempts to answer societies’ monetary, and in some cases social ills, through unofficial means. 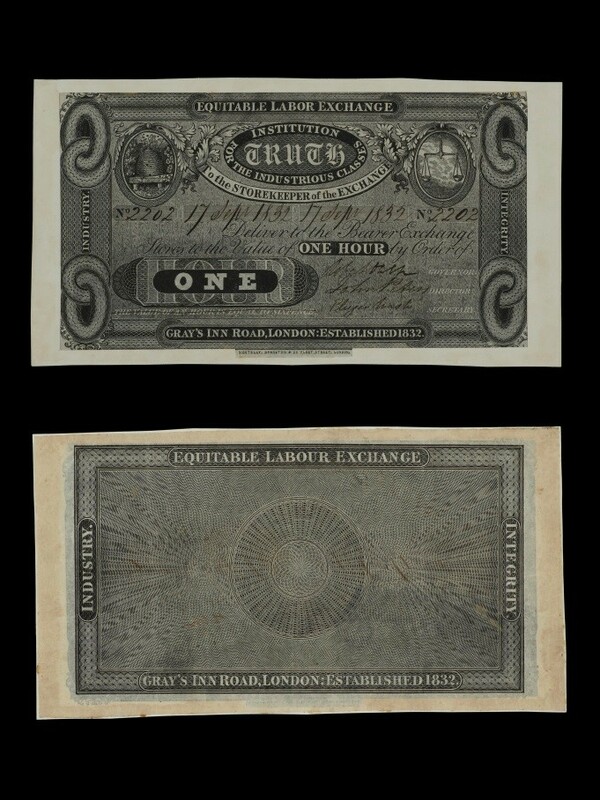 The work of social reformer Robert Owen is highlighted through paper money created by the Equitable Labour Exchange, an organisation begun by Owen in 1832 that aimed to better reward labourers for their work. 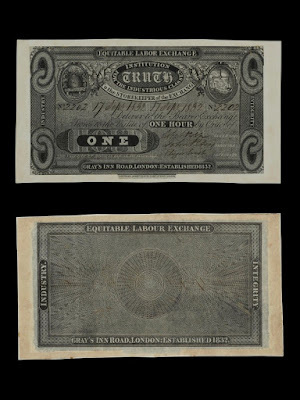 The notes, which would have circulated locally in central London, were produced not in the currency of the day, pounds, shillings and pence but in hours. Public confidence in money is also a recurring theme, from the great debasement of Henry VIII where he systematically reduced the silver in his coinage to fund wars and the building of lavish palaces, to attempts by individuals to counterfeit currency. 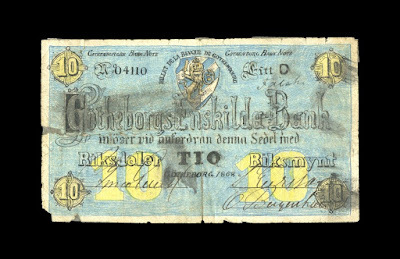 A particularly fine example is a counterfeit Swedish banknote that has been lovingly recreated by hand. Whether it worked or even if it was worth the time and effort we will never know. Someone felt compelled to try. The Euro, first issued in 1999 is often seen as the exemplar for the coming together of nation states and a shared single currency. It was however not the first time such an attempt had been made in Europe. To enable easier trade between European countries the Latin Monetary Union was formally created in 1865 between France, Switzerland, Italy and Belgium. This Union saw the creation of coinages of a similar weight and fineness which could be exchanged across borders. The museum’s rich and varied collection discusses the functions of economies and their impact on society. From objects thousands of years apart that speak to one another like a Roman papyri referencing the repayment of a loan to a modern letter from a debt collecting agency threatening repossession. Small objects can often tell global stories. 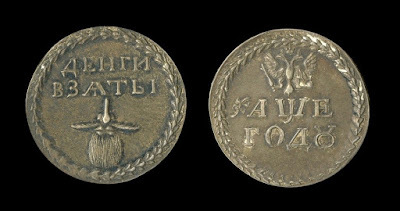 A countermarked 8 reales coin from the 18th century issued in Spain, minted using silver from South America, has stamps approving it for use on the Isle of Bute in Scotland and then latterly in China. 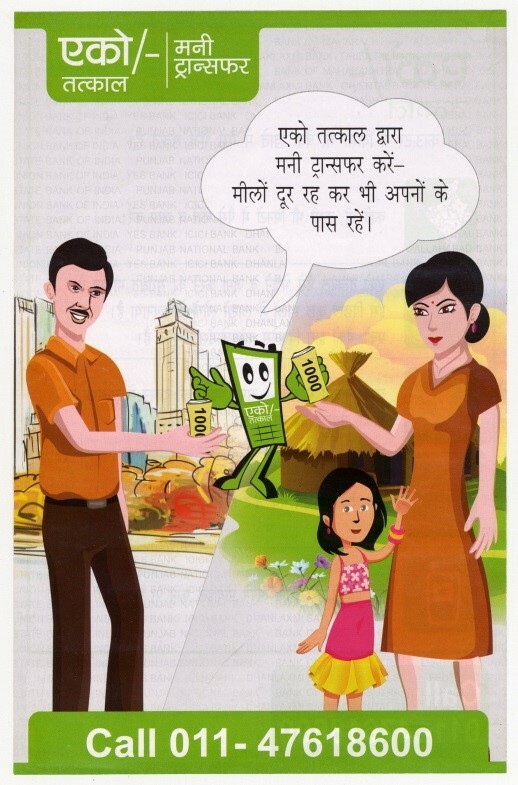 The coin speaks to a financially interconnected world that we as a modern audience would recognize. The exhibition does not just deal with the global financial world but also hopes to encourage visitors to reflect on their own relationship with money. A print by German artist Fritz Lang titled ‘Mortgage Joy’ celebrates the purchasing of a new home and sheds light on what some societies think of as important assets. Similarly Roman bankers tallies from the 1st century BC are used to highlight a banking system which offered the wealthy numerous opportunities for loans whilst the poorer members of society had to use money lenders at a much higher personal cost. This access to money and banking systems is fundamental to the changing nature of society. A point exemplified by a leaflet donated to the museum by Mani Arul Nandhi through the IMTFI, which shows a man in the city sending money via mobile phone to his family who live in rural India. It is the role of technology that is discussed by the central object created especially for the Money Matters exhibition by artist Olga Bagaeva. Fiat Coin is an attempt to represent the confusing, labyrinthine intricacies of the modern financial system. In doing so suggesting that money lives a double life. From our personal interactions with commercial banks and their products, to the abstract, distant mechanism of investment banks, hedge funds, data centres and regulating authorities. Search the British Museum for more IMTFI money objects here. View previous blogpost, Haiti's mobile money at the British Museum.